The AlexTriVantage™ laser removes tattoos of all colors gently, safely and comfortably – not only blues and greens, but the reds too. It also easily and effectively removes pigmented lesions such as age spots, sun spots, and freckles. What should I expect before my treatment? We will consult with you and review the pre-treatment procedures. The skin being lasered must not be tanned. If the client has a history of cold sores in the area to be treated, a prescription for an anti-viral medication should be pre-arranged with their physician, to be started the day before the laser procedure and taken for a few days afterwards. Clients who have had Accutane for acne may not have laser for at least 6 months (and possibly one year) after stopping Accutane. We encourage you to exercise regularly, drink lots of water, and massage the treated area (once healed). Maintaining a healthy lifestyle before and after treatment, and using SPF 30 on treatment areas are good aftercare tips to get the best results. We will provide each client with proper aftercare instructions. How long will it take to remove? The duration of the tattoo removal process is a concern for virtually all clients. It’s not unusual for the body to take over a year to completely eliminate ink. Setting expectations clearly upfront allows for clients to be satisfied throughout the experience – rather than feeling as if they were misled. It’s important for us to establish upfront that tattoo removal is a process that relies on the body’s ability to eliminate ink from the skin. We will help set realistic expectations clearly upfront to allow our clients to be satisfied throughout the experience. To allow the skin enough time to heal between treatments and the body’s immune system to flush away ink, we recommend a minimum of eight weeks between laser sessions – and ten weeks for darker complexions. Stacking the treatments too close together can cause damage and permanent side effects to the skin and doesn’t allow the body enough time to remove the ink that was shattered at the most recent session. For ideal results, we recommend waiting three months between treatments. We generally suggest speaking in terms of treatment ranges with clients. Tattoo removal treatments fit along a bell curve – most clients will need between 6 and 12 treatments, some will see complete removal in 5 or 6, and others may need 12 or more treatments if there is significant scarring or layered tattoos. We suggest telling clients where they are likely to fit along the bell curve based on the unique factors of their tattoo. 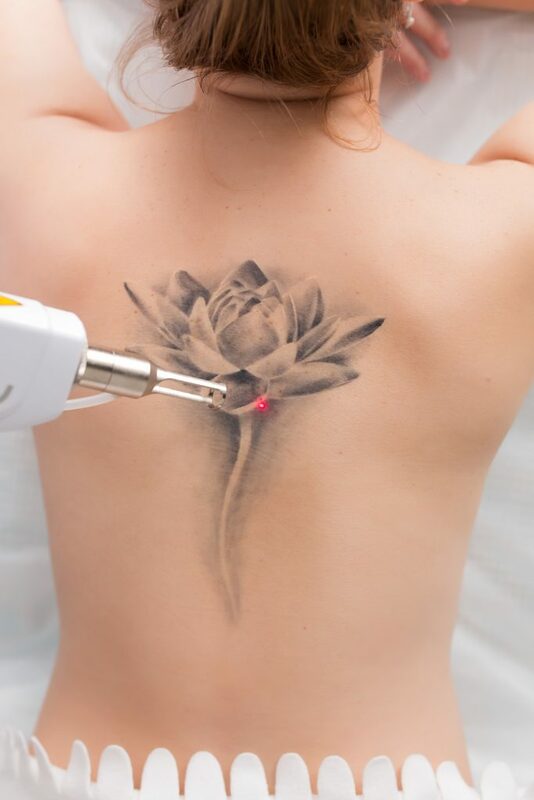 Laser tattoo removal typically does involve some level of pain. That said, many say that it hurts less than they expected. It’s a common belief that tattoo removal is excruciating, yet most clients say that the sensation of removal is comparable to having a tattoo applied. Common descriptions include the sensation of a rubber band snapping against the skin or bacon grease – basically it’s uncomfortable but bearable. It hurts, but it’s bearable. We advise clients to use a topical anesthetic such as 5% lidocaine 45 minutes before treatment covered with a plastic film to help the topical absorb into the treatment area. Numbing skin before the procedure helps clients feel more comfortable throughout the treatment process. Are there side effects with Tattoo Removal? If all of the proper protocols are used based on the tattoo and the client’s skin tone, all of these side effects are temporary. Redness, tenderness, and swelling typically subside within a day or two following treatment. Blisters usually appear within 24 hours of treatment; sometimes the blisters are very large and may look alarming – this is completely normal. Scabs, bruising, and blistering may take up to a week or longer to heal. Expect the treated skin to become red and raised immediately after the procedure. We ask our clients to leave the skin alone and let the area breath for the first 30 minutes after the procedure, then soothing Aloe vera or cold pack may be applied to sooth the area. It is important to allow the skin to start the natural healing process. Some redness and crusting may last for 7–14 days. Clients are asked to apply antibiotic ointment and a Band-Aid if necessary to the treated area for 1–2 weeks only if the skin is broken or weeping otherwise leave the skin to heal naturally. It is important to protect all your skin from the sun every day by using sunscreen with an SPF of 30+, and by wearing sun-protective clothing. For the next 24 hours:A cold compress and elevation are recommended to help reduce discomfort and inflammation. Apply for the next 3 days: Aquaphor, Elta MD Post Balm, Neosporin, Polysporin or A&D Oinment with bandage only if the skin is broken or weeping. Any of these ointments will work. Change the dressing daily. Please call your primary care physician if an infection occurs. If you have any questions or concerns, please don’t hesitate to contact our office.